As with any arena regarding design, we all begin by posing a thesis. What kind of creators are we in our approach? Over the years I have moved from neat, controlled floral arranging to a larger focus on creative play. In my approach, I hope to allow the blooms to speak for themselves. I focus on composition and color selection. In a world that seems so harsh and rigid at times we need a place to create something soft and balanced. We will explore these elements in our upcoming workshop. With a beautifully curated meal with Pixie combined with floral play, you're sure to find your "little joy". Looking back on how this all started -- WOW. When Katy approached Melina and I last year to create this collective of the three of us--pool our talents and offer classes (and a women's retreat!) --I was juggling wedding planning and my day job and moving back to Brooklyn...there was so much going on! But I love what we are doing. We're opening up our space and our hearts to folks, providing creative nourishment just by way of the medium, and showing them how to enjoy the little things. Melina does an amazing job teaching her floral class, going in depth and providing true encouragement. Katy is so smart with her research on food and the ethics and flavor behind it all. 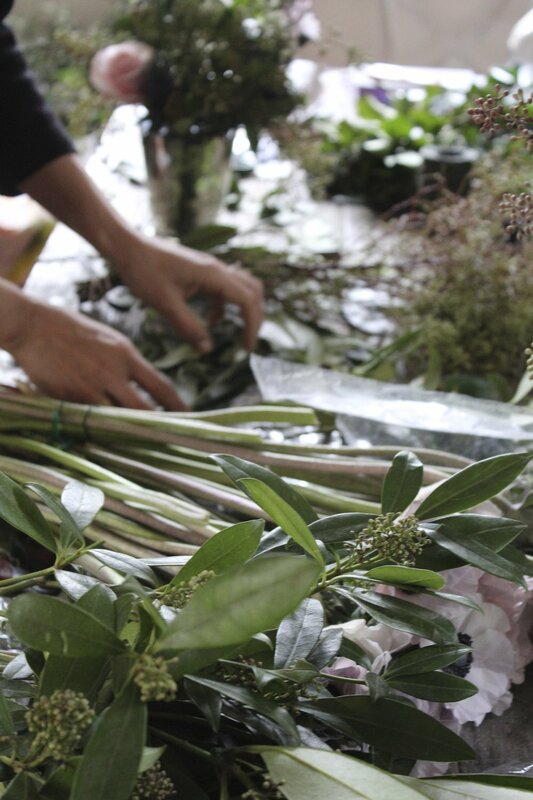 We want to make flowers (and understanding them) accessible to people. Sourcing them in NYC, the seasonal varieties...we noticed that taking a floral class from any of the big names costs so much! (We're talking between $500-$1000). What ?!?!? And you don't even get the kind of amazing menu we're designing. I am excited to share with everyone that we want to do it differently -- put back the heart in it and truly create an experience for folks to pluck themselves out of the daily grind, have a "littlejoy" and then take it with them to flourish elsewhere.